Master the rules and leave nothing to chance. Because life is a game and the winner takes it all. The Game was developed by perfumer Bernard Ellena; notes include gin fizz accord (juniper berry), iris, precious woods and blackwood. 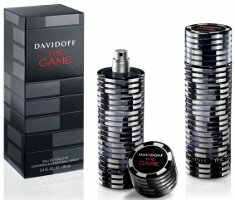 Davidoff The Game will be available in 100 ml Eau de Toilette. Iris, gin fizz, blackwood and (?) precious woods (I bet they’re synthetic!) I think I’m not interested, even by the iris. And the bottle looks like a pile of casino tokens, right? Yep, or poker chips, however you want to look at it. The notes sound lovely. On the other hand, I associate poker chips either with the smell of beer and pizza (from games between a bunch of buddies playing in the home of one of them), or (the much much worse) smell of stale cigarettes, cold sweat and tacky air freshner from games at casinos. Really don’t like the bottle, lol. The bottle seems like a One Million wannabe. I think the notes have potential, though! I’d love to smell iris, woods, and juniper on a guy.